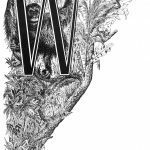 If you are looking for drawings of the letter W, you have come to the right place. All of these fancy letter images are in the public domain. They were discovered in a variety of vintage books, magazines and other printed materials. They are offered by Reusable Art for for scrapbooking, webpages, and any other projects where drop caps are used. All of these images are copyright free in the United States. Information regarding their original publication is included for you to verify the copyright status in other countries. Open letter W image suitable for coloring. 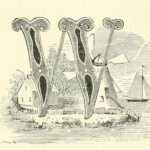 Small, but versatile letter image from 1860. 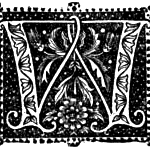 Vintage letter W with Vines from 1878. 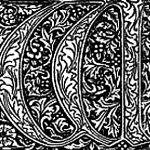 This letter image is one of several covered with ivy vines that was sold by a print foundry. 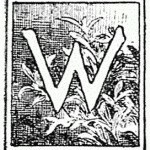 Vintage letter W design from a book from 1887. Public domain and free to download. Features leaves, flowers and vines all in black and white. 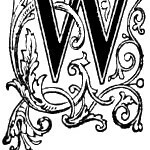 Fancy letter W drawing with a white W on a dark background. Its from 1893, is in the public domain and would make a great addition to a crafty project. 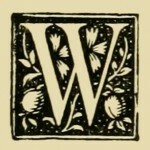 William Morris, most widely remembered for wallpaper and interior design, also published illuminated works which included fancy letters like this W.
Vintage drop cap letter W; one of a set of 11. A garden wall is the perfect backdrop for this capital letter W image. A windswept coast and a windmill adorn this fancy letter W image. Black and white fancy letter W drawing.